Luckily, Portland’s living room can easily accommodate a 75 foot tree! 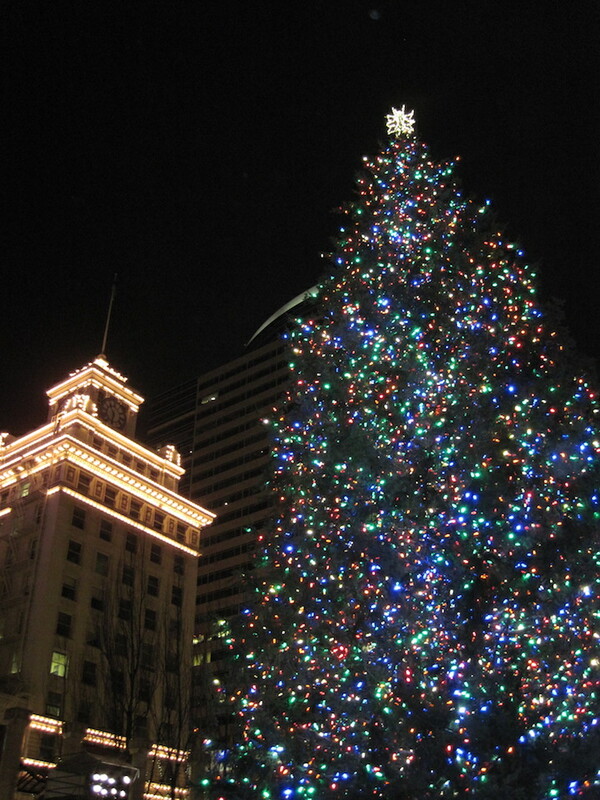 Thanksgiving’s right around the corner, and that means it’s time for us to present Portland’s Holiday Happenings for 2016! We’ve included a little something for everyone, but if you can’t find what you’re looking for here, check out the event calendars at PDXPipeline or the Oregon Live Events Guide. There’s LOTS to choose from if you’re looking to celebrate! November 25th kicks off Portland’s holiday hubbub this year, starting with the Macy’s Holiday Parade at 9:00 a.m. and Portland’s tree lighting and caroling in Pioneer Courthouse Square at 5:30 p.m. This is always a festive event, even when it rains (which is almost always). We’ve enjoyed this both amidst the crowd as well as from high above at a rooftop bar. We’re partial to joining in the singing! Winter Wonderland Nov. 25 – Dec. 25. This drive-through light show at Portland International Raceway is billed as the largest display of holiday lights west of the Mississippi! 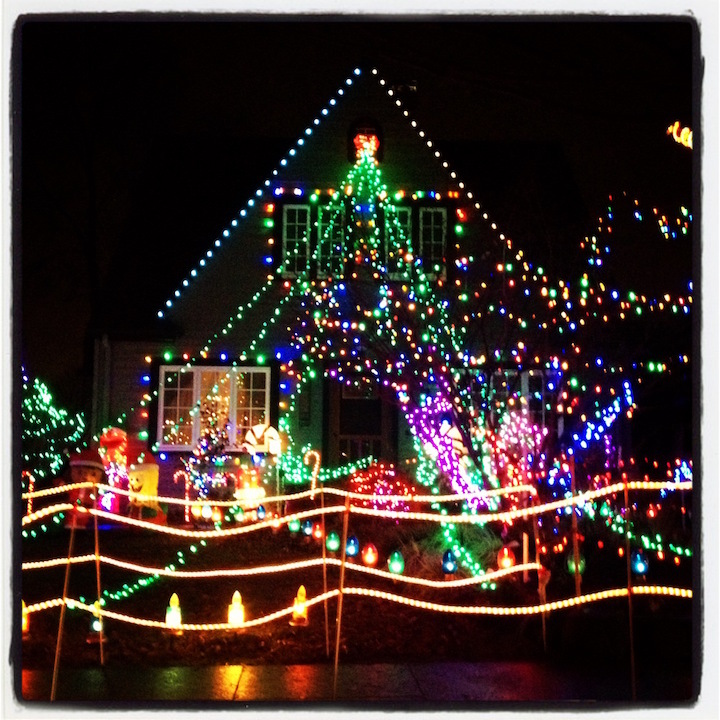 Christmas Festival of Lights Nov. 25 – Dec. 30. Thousands and thousands of lights are strung through the Grotto’s beautiful grounds, making this a peaceful place to spend an evening. Carolers perform on most nights, too. Zoo Lights Nov. 25 – Jan 1. All kinds of fun animal-themed light displays decorate the Oregon Zoo. Not sure how the animals feel about it, but it’s a patron favorite! Peacock Lane Dec. 15-31. A Portland tradition since the 1920s. We’re so lucky we live just blocks from Peacock Lane, so we get to visit every year. It’s quite a quaint little tradition that makes Portland feel like a small town. Christmas Ships Dec. 2-18. With two rivers running through town, we’ve got lots of people with boats, and they like to celebrate in style. You can watch from the river’s edge or go to one of the many restaurants on the river for a warmer viewing spot. Christmas in the Garden Nov. 25 – Jan. 1. Light festival and German marketplace at the Oregon Garden. PLUS, they have an outdoor ice rink!! If you’ve been longing to skate outdoors ever since Lloyd Center put that darn roof on, here’s your chance. We visited the Oregon Garden this fall, and it is a beautiful spot. Festival of Trees Dec. 2-3. Elaborately decorated Christmas trees, mini-trees, wreaths and holiday displays await those who head to the Oregon Convention Center to get into the holiday spirit. Hands-on fun include frosting cookies and patching up stuffed animals at the Teddy Bear Hospital. The event is hosted by Providence Health, and proceeds benefit cancer research. Portland Menorah Lighting Dec. 24-31. The annual lighting of the Portland Menorah, nightly during Hanukkah in downtown’s Director Park with children’s activities and the Dreidel Man on the 25th. A Christmas Carol Portland Playhouse, Dec. 3-28. I’ve seen it so many times, and I still want to go this year.The classic Christmas tale IMHO. The Santaland Diaries Portland Center Stage, Nov. 26 – Dec. 24. David Sedaris. Nothing else needs to be said. If you haven’t seen it, make this the year. 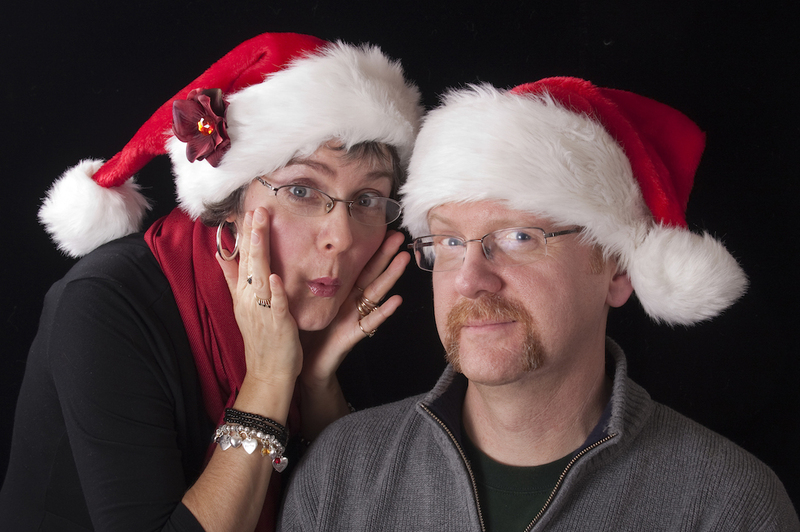 A Very PDX-Mas Broadway Rose Theater, Nov. 23 – Dec. 22. 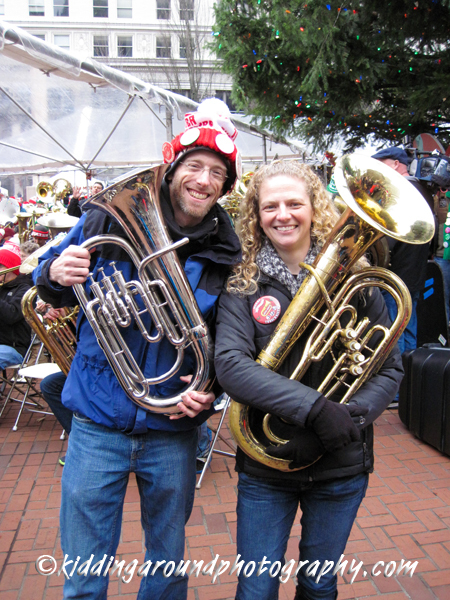 A musical sleigh ride through the holidays in Portland. The Nutcracker Oregon Ballet Theater, Dec. 10-26. A holiday classic. Singing Christmas Tree Keller Auditorium, seven performances between Nov. 25 – Dec. 4. Get your tickets soon for this one if you’re hoping to see the world’s largest living Christmas tree. Tuba Christmas Pioneer Courthouse Square, Dec. 10. It starts at 1:30 p.m., but get there early if you want to sit down. Really early. If you haven’t been before, you should really check it out. Many other cities have them as well. We’ve even been to one in Punta Gorda, Florida! Three community groups are getting together to put on a Kwanzaa Karamu, a feast and community celebration, on December 3rd. The event will be held at the PCC Cascade campus. Tickets are free but must be ordered in advance. Along with a pickled herring eating contest, Joulupukki (Finland’s Santa Claus) will be at Portland’s annual Scandinavian festival, ScanFair, going on Dec. 3-4 at the Memorial Coliseum. We’re betting they have some tastier-than-herring Scandinavian treats available as well, and you can even get your photo taken with Joulupukki! It just wouldn’t be Portland without a beer festival, and the folks sponsoring the Holiday Ale Festival will be ready to get the season off to a great start in a giant tent at Pioneer Courthouse Square from November 30-December 4. Portland’s Saturday Market is a fantastic opportunity to buy handmade gifts from over 250 local artisans. The gifts range from food to clothing to fine art and everything in between. Open on Saturday and Sunday only from March – Christmas, but they are open every day in the week leading up to Christmas Day. They call it the Festival of the Last Minute. Little Boxes is a city-wide event to encourage patrons to shop “indie and local” stores on Black Friday and Small Business Saturday. You get a stamp card at the first participating retailer, and unlock discounts the more shops you visit. There are also prizes that can be won in a raffle drawing. Get the map or participating shops and all the details on their website. Oregon’s Ugliest Sweater Run is a pet-friendly 5K race that also offers an egg nog chugging contest, a fruitcake eating contest, and, of course, an ugly sweater contest! Held in suburban Tigard on Dec. 4, the event is free for spectators and $39 for runners. Parking is free, but an unwrapped toy donation for Toys for Tots is requested. Santacon is, well, hard to define. If you’ve stumbled across dozens, even hundreds, or perhaps thousands, of folks dressed up in Santa costumes presumably in the midst of a pub crawl, you’ve seen it. But even those who participate sometimes have a tough time nailing it down, and there’s even controversy about which version (there are three in Portland alone) is the authentic / original / best one. From our perspective, they all look like a good time! Sing Along Messiah provides an opportunity to join a huge holiday choir and belt out Handel’s masterpiece in four-part harmony. Several opportunities dot the calendar in December, but the biggie is held at Central Lutheran Church, where we joined hundreds of folks and even got chills during the mighty Chorus! Holiday Express takes riders back in time in vintage rail cars powered by a steam locomotive. Santa and his elves are along for the 45-minute round trip ride that passes through Oaks Bottom along the Willamette River. Hands On Portland posts a calendar of volunteer opportunities for those who’d like to give back a little during the holidays, and for those who prefer to let their fingers do the walking, Willamette Week’s Give Guide makes it easy to support – via online donation -any or all of 141 non-profits that impact the Portland area. Enjoy your holiday happenings this season, whether they’re for a day, a week or a weekend! Hey, I love the herring at Scanfest! Ha! We’re sure it’s delicious … just not as delicious as some of those desserts! 😉 Hyvää joulaa! Lots of fun stuff all over town. How about in Calgary? Calgary is ok. It aint Portland, but it’ll do, , , for now ;). Ha! Let us know the next time you’re in Portland! Cheers! Another cool shopping event I am going to check out is the Woodworker Holiday Market at Baerlic Brewery on Dec. 3. Looks like a great way to combine two things I love – beer and handcrafted items!